However, established clothing manufacturers wanted to capitalize on this movement too, so they created niche labels to project the “boutique” image. Dollyrockers by Samuel Sherman (aka: Sambo) was one of them. Dollyrockers turned to collaboration to further market the label, and claim it’s spot on London’s youthquake map. 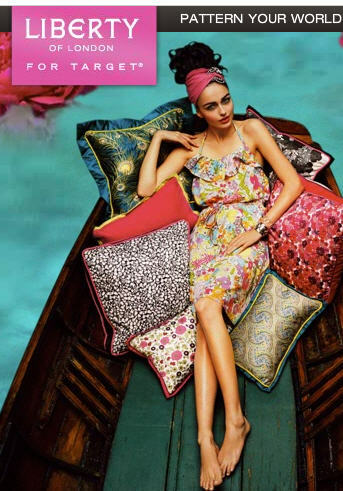 It’s no surprise that they collaborated with an established fabric manufacturer such as Liberty, known for its eclectic and colorful floral prints for mass market, and it makes sense now that Liberty would collaborate with large players such as Target and MAC, which position themselves strongly in the youth market. The Dollyrockers /Liberty Prints label is now very collectible, although not as “boutique authentic” as an Ossie Clark or a Foale and Tuffin, started from scratch by these independent designers, it’s still a sought after label. I would love to see a new collaboration done with the Dollyrockers label, maybe with new print designers? 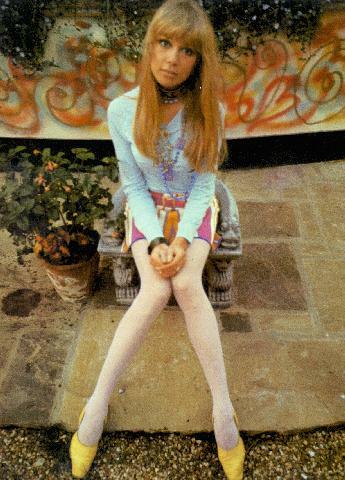 The face for the Dollyrockers label, was Pattie Boyd (who had just started dating George Harrison). I have a black and white photo of a friend any myself c. 1960. I’m wearing a Dollyrocker empire line dress , top in black and white check, skirt in ‘shocking pink’, with a blak velvet ribbon below the bust. What’s more, I was married ina Dollyrocker dress and coat in1967. That sounds amazing! I would love see photos and with your permission if I can post it with this article. I designed for Dollyrockers! My first job when I came to London from the north.Patti was the face of Dollyrocker.I went on to design for Mr Freedom, Paradise Garage,body Shop, Secret Ingredient, Marshall Lester, Photo,etc and still work in the Kings Road. Hi Diana! That is so cool! You’re an original Dollyrocker! I’m so glad you commented on this post. Mr. Freedom! Secret Ingredient! It sounds like you have an amazing portfolio. 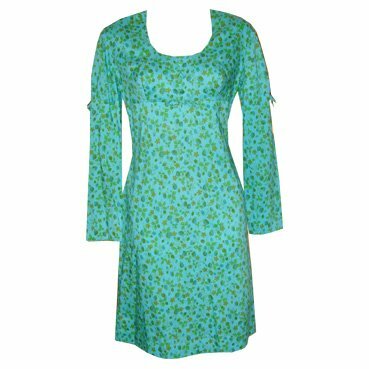 I would love to see your photos and hear about your experience with these labels and the 60’s-70’s boutique fashion scene. Let me know if you’d like to post your story on here. 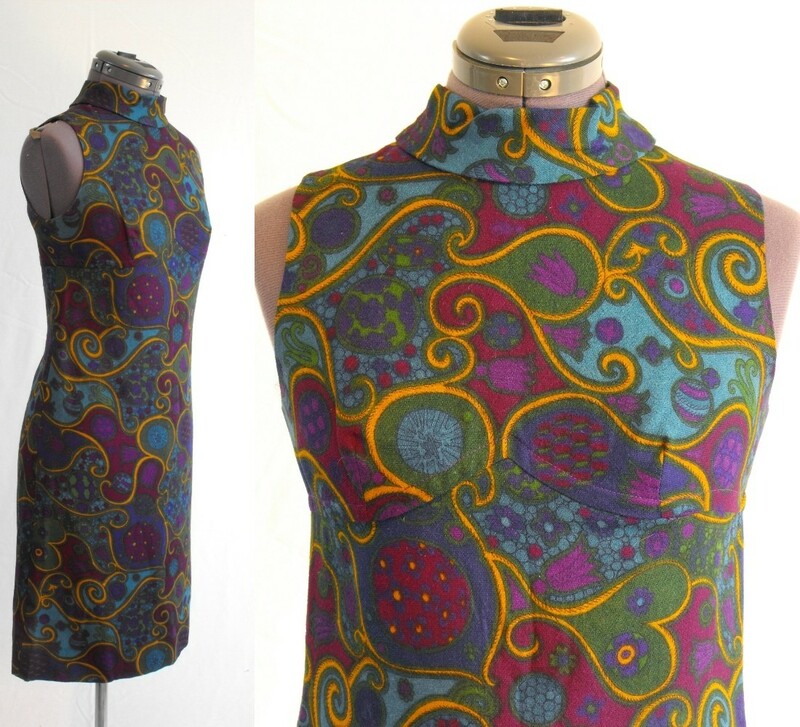 I just received a Dollyrockers/Liberty Print dress from etsy, decided to do some research, found this article and the dress is the purple paisley one exactly as seen in the photograph above. Is the photograph from an etsy posting (that is where I ordered it)? Do we know anything about that dress, print, etc…? …also check out the other related links at the end of this post, as they may offer more info on this. my favourite dresses were Dollyrockers. I bought then from Wallis in Bristol. 1967 was just great,,, youth, I was 17, music and fashion and freedom. Previous Previous post: Is it Vintage?